Bishop Museum's Amy B.H. Greenwell Ethnobotanical Garden in Kona, on the Big Island, invites all to celebrate the native landscape at its free Second Annual Grow Hawaiian Horti/Cultural Festival, taking place 9 a.m. to 2:30 p.m. Saturday. The festival will feature talks and discussions on native plants and gardening, cultural demonstrations and an opportunity to talk to experts on birds, insects, plants and Hawaiian arts. Throughout the day, festival-goers will enjoy plant sales, keiki activities, traditional artisan demonstrations, Hawaiian food, entertainment and more. Parking is available in the grass lot next to Greenwell Park near the Manago Hotel. For more information, call 808-323-3318. Bring mystery and sick plants for identification and diagnosis during the Horti/Cultural Festival. 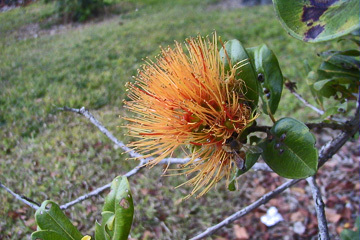 Shown is the native 'ohia lehua.